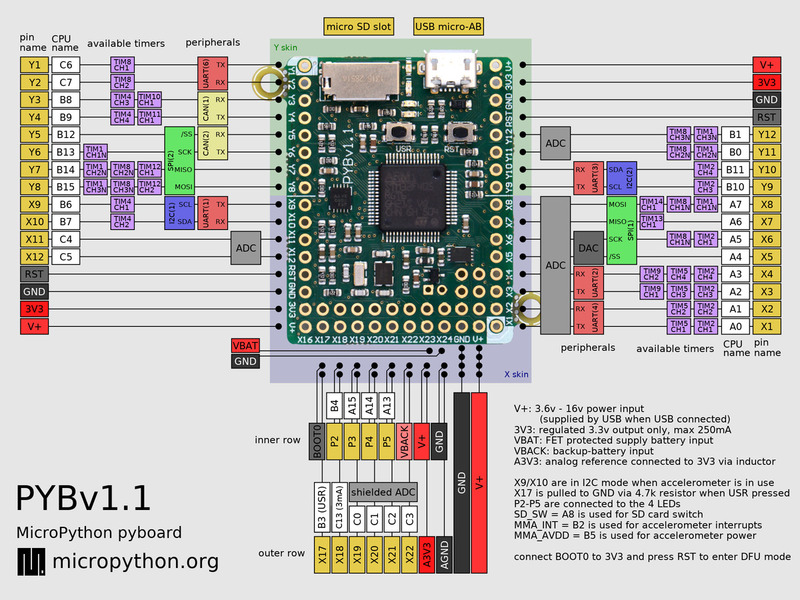 Looking at http://micropython.org/resources/pybv11-pinout.jpg i see that I should be able to power the pyb directly from a tractor electrical system which is ~14 V when the tractor is running as the image says V+ can be 3.6-16 V. Is this correct? I've been using a 9 V regulator on my protoboard to feed V+ but would rather ditch it if it is not actually needed. So can I feed the pyb directly with the 14 V from the tractor? In theory you can. Practically I would only with a good analog LC lowpass filter in the supply line. Car/Tracttor electric can carry nasty spikes. Is a 7809 regulator sufficient then? The 7809s have max input voltage of 35V. That#s a good margin. I would still add some kind of low-pass filtering to the input, like an RC element. The C is anyhow need at the input side of the LM7809. Do you have any suggestions for the RC as my knowledge of electronics is very rudimentary? The values are not very critical. R in the range of 2.2-3.3 Ohm, C consisting of ~470µF parallel to 0.1 µF. The R into the wire leading to the LM7809, the Cs between the input of the LM7809 and GND. At the output of th eLM7809, you need at least 10 µF. All automotive systems suffer from alternator load dump which generates positive and negative spikes in the +/-60 to 80 V range. If the alternator is supplying 10A to the headlights and you turn them off the 10A keeps flowing, slowly reducing as the field current collapses. This causes the alternator output voltage to increase until the other loads can absorb the energy. I strongly recommend an automotive regulator such as LM2940 which can handle load dump including negative spikes. I also recommend using a 16V TVS diode on the regulator input. A filter as suggested will limit the current into the TVS diode. Thank you for your suggestions! I'll do that.